Its almost like I gave myself a personal challenge today, how many fabrics can I squash into one outfit. 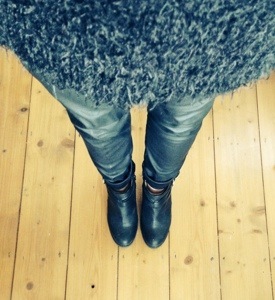 Denim shirt, leather trousers, big fluffy jumper, leather boots with gold hardware… lots going on! This jumper is a new personal favourite. Its massively over sized, which is exactly what I want from a jumper, and the most cosy thing I own. Apart from my new onesie, which is like having a cloud hug you. At only €14, this jumper was an absolute steal in Penny’s. The shirt I’ve shown you guys before, borrowed from the Amy Closet (my sister). 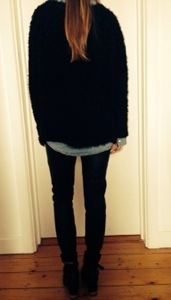 It helps to break up the leather trousers and the jumper as well as providing an extra layer. The leather pants you’ve also seen before, a River Island favourite. I turned them up a little at the ends so they weren’t stuffed into the boots. Apologies for being decapitated in the photos by the way. You know the way most people have bad hair days? Well I have bad face days. Its when my make up doesn’t work and I’m even worse at taking photos. Hence, Headless KB. Enter your email address to follow Okaybee and receive notifications of new posts by email.